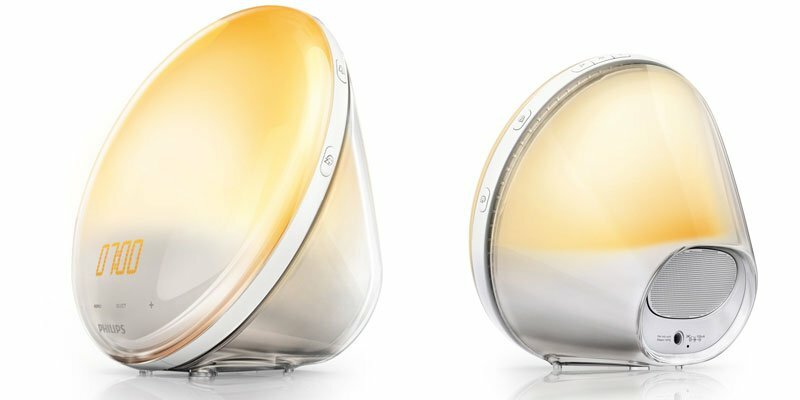 An in-depth look at the 2019’s best sunrise alarm clocks, dawn simulation devices and smart circadian light bulbs. Find out how sunrise alarm clocks work, what to look for in a wake-up light and the scientific benefits to your sleep and health when you wake up with a dawn simulator lamp. What is a sunrise alarm clock? Is a wake up light better than a normal alarm clock? Alarm clocks are a necessary evil. In a utopian world, we’d all wake up naturally. But commuter trains, work schedules and the school run mean that most of us rely on an alarm to shake us out of slumber every morning. The problem is that alarm clocks don’t respect our natural biological rhythms, they just provide a rude awakening, regardless if we’re in deep sleep, lightly dozing, or in the middle of dreamland. This often results in that groggy, lethargic ‘wrong side of bed’ feeling, especially on dark winter mornings, when there’s less daylight around, and the effects of seasonal affective disorder (SAD) can cause even more misery. If this sounds familiar perhaps you want to try waking up with a gradual light alarm clock – also known as a sunrise alarm. How Do Sunrise Alarm Clocks Work? A sunrise alarm clock (also referred to as a wake-up light, or a dawn simulator) allows you to wake up in a gradual way, easing you into the day, instead of jarring you out of bed with a loud buzzing alarm tone. 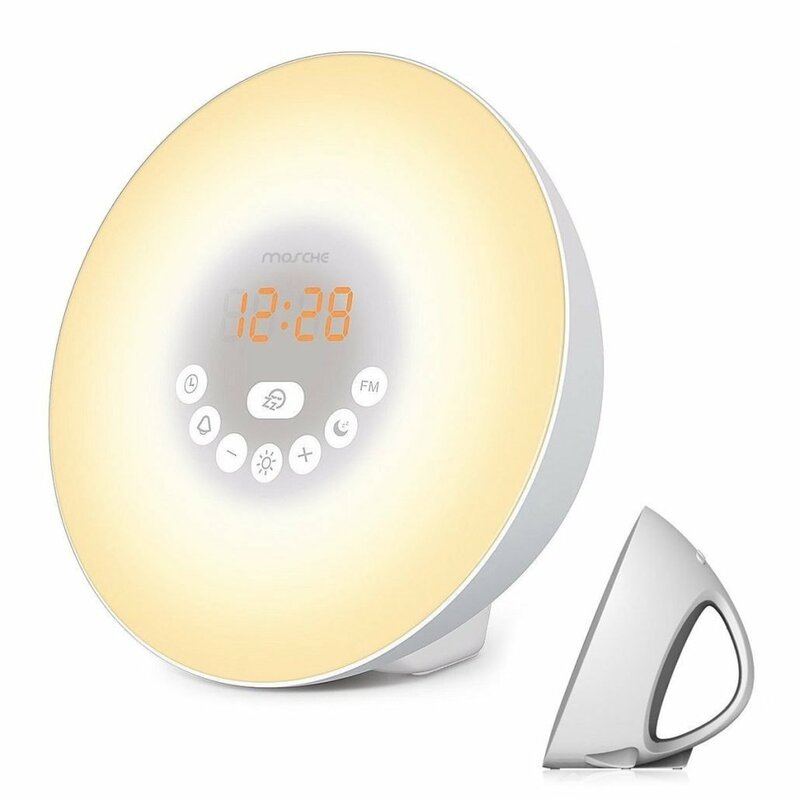 Sunrise alarm clocks simulate the natural dawn sunlight with a gradual increasing light. 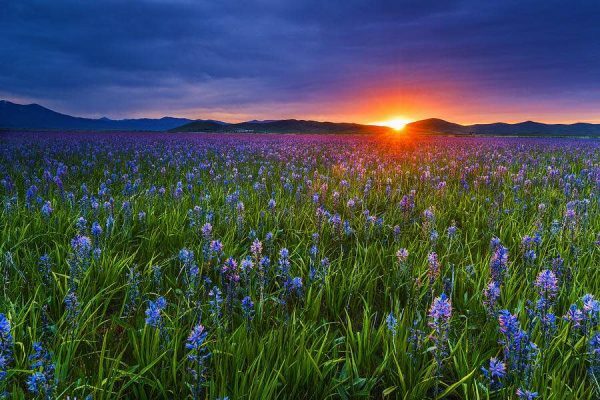 Because our bodies have evolved naturally over millions of years to wake up this way, a dawn simulation can be a much more natural and healthy way to start your morning than a normal alarm. You can check out our detailed guide on sunrise alarms below, but first, here are our top recommendations for the best sunrise alarms and wake up lights. The Philips HF3520 is the #1 best-selling wake-up light on Amazon. As a leading global manufacturer of electrical goods and services, Philips is the dominant player in the market for wake-up lights. The HF3520 is near the top end of their range of wake-up lights and is Philips’ #1 best-selling wake-up light alarm clock, with nearly 4000 Amazon reviews. It’s easy to see why the HF3520 is so popular. It features a striking circular design, looking like a giant light bulb on its side. The conical shaped body tapers towards the back where the built-in speaker resides. On the front panel, near the front clock display you can control the menu functions via touch-sensitive capacitive controls. On the upper rim of the light you have several buttons to switch on the light and control the brightness. With over 100 years of experience in the lighting industry, Philips have put a lot of thought and research into making the HF3520’s sunrise simulation as good as it can be. The light source is a multi-colored LED lamp with a maximum intensity of 300 lux (that’s pretty bright!). In sunrise simulation mode, the colors subtly and naturally blend, starting with a deep red, then gradually shifting to orange and yellowy-white tones as you approach your wake-up time. You can vary the maximum brightness by 20 levels, depending on how sensitive to light you are in the morning. On the sound front, the Philips HF3520 doesn’t do too badly either. There are several options to wake up to: an FM radio, a choice of 5 nature sounds -including bird Song, gentle piano and seaside sounds – or a plain alarm tone. If you wish you can also choose to mute the sounds completely and just use the wake-up light as an alarm. If the alarm doesn’t get you out of bed the first time, there’s a touch sensitive snooze function. Just tap the front of the light and the alarm will go off, giving you an extra 9 minutes of sleep. If you like to stagger your alarms, or set different wake-up times for the weekend, the HF3520 has two independent alarms. 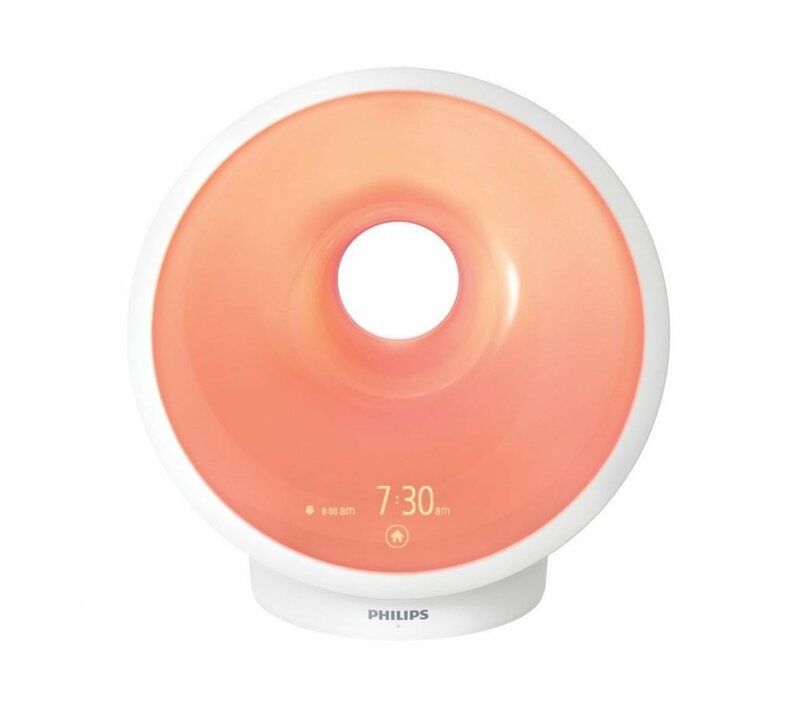 Finally, the Philips HF3520 has a sunset simulation mode, whereby sound and light will gradually fade out for a relaxing way to drift off to sleep. Somneo is the latest addition to Philips range of sunrise alarm clocks. 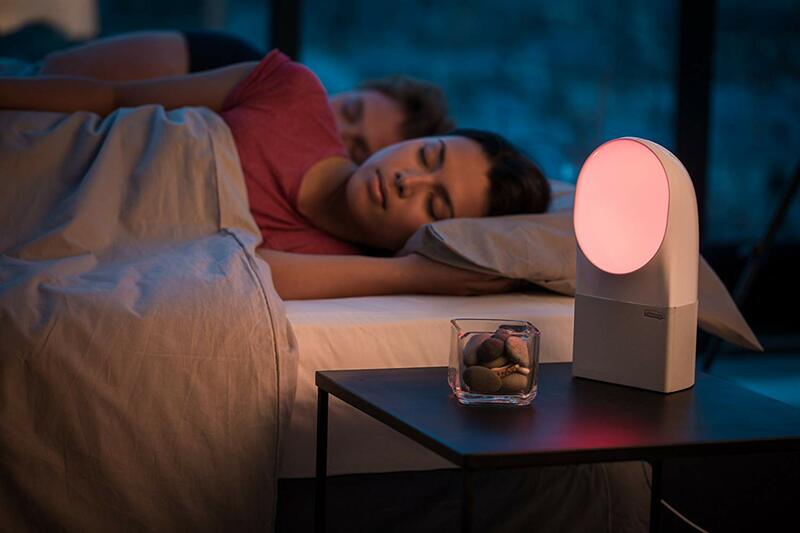 Somneo is a light therapy lamp and sunrise alarm clock with 7 natural wake up sounds, an FM radio, white noise generator and a customisable smart display. What sets Somneo apart is its new RelaxBreathe sleep aid feature which uses guided breathing programs to help you drift off to sleep faster. A study found that 79% of Somneo users reported falling asleep easier with the RelaxBreathe function, after just 2 weeks of use (MetrixLab, HUT Sept 2017, US N=113). The Mosche Sunrise Alarm Clock is a quality, value for money wake up light that’s feature packed and boasts over 500 reviews at Amazon. The feature list includes a choice of 7 light colors – indigo, purple, blue, green, red, orange and white. You can use these as a general mood lamp at night or as a gradual wake up light in the morning. There are 10 adjustable brightness settings. There are also 7 wake up sounds to choose from. These include nature sounds – birds, forest and waves, or if you prefer you can use the built-in FM radio. Sunrise/Sunset Simulation — The wake up light will be on from 1% of the brightness to 100% at set time to bring you out of deep sleep gently to welcome a refreshed day; And Sunset function will guide you to natural, restful sleep. The Mosche wake up light can be charged via USB and also takes 3 AAA batteries to be used as a power backup in case of a power failure. All in all the Mosche is a solid all-rounder with a great feature that offers top value for money. Quite possibly the best cheap sunrise alarm you can buy is made by Homelabs. It’s a popular, feature packed value for money wake up light with over 900 reviews on Amazon. For only around $20, this dawn simulating gradual alarm clock will ease you into your morning routine. It Featuring 6 vibrant colors, a range of nature and sounds and tactile easy to use touch controls making it easy to use for anyone including in your child’s bedroom. If you’re looking for a gradual wake up light, these days you’re not limited to buying a bedside sunrise alarm. Today, home lighting systems are becoming increasingly sophisticated as they take advantage of ‘connected’ technology platforms collectively known as IoT or the internet of things. Using wireless Bluetooth and Wifi, IoT allows you to connect not just your home lighting, but also heating, door locks, refrigerators, even your toaster! Voice assistants like Amazon’s Alexa voice or Google Home can be used to control and automate any aspect of your smart home. In the world of smart lighting, the market leader is Philips with their Hue personal wireless lighting system. Hue lighting uses smart LED technology to control and automate your home lights however you want; you can even create a Hue sunrise alarm! As well as Philips Hue lights there are also many other smart LED bulbs that can turn any light socket into an intelligent lighting system. One of the most popular is the MagicLight Pro Smart LED Light Bulb. 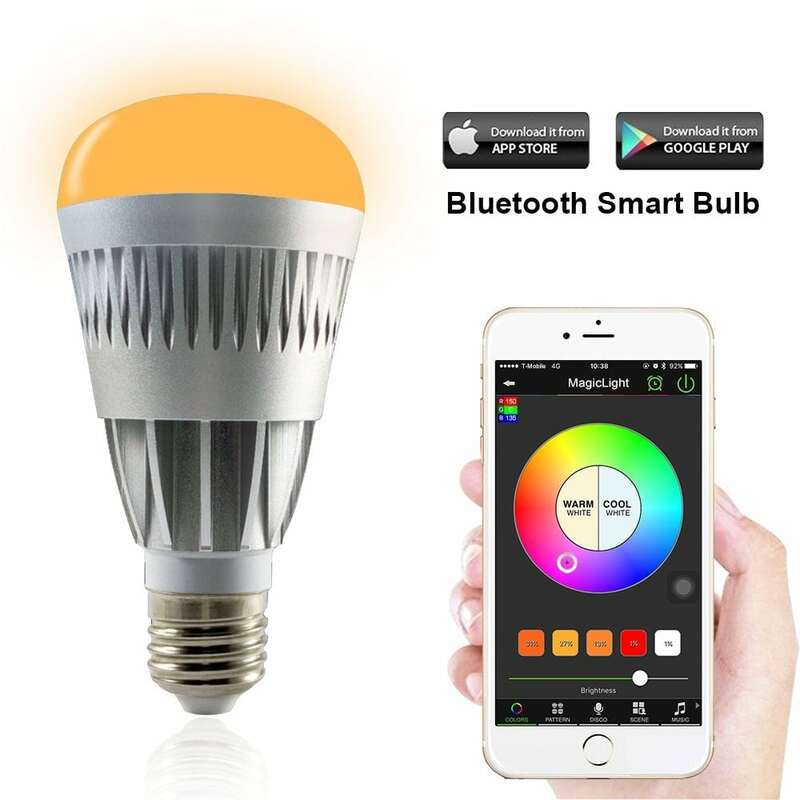 As you’ve probably guessed by now, the MagicLight Pro Smart LED Light Bulb is not an alarm clock, it’s a Bluetooth or Wifi enabled, multicolored, energy efficient smart LED light bulb that you can program and control via your iPad or iPhone or Android device. The MagicLight Pro works by simply screwing into a standard light fitting. It takes its power from the light socket, and all the clever stuff is then controlled and managed wirelessly via Bluetooth or Wifi on your phone or tablet. Without going into all of the other functions, let’s explain how the sunrise mode works. Because it’s a standard fitting, you can choose whether you want to fit the bulb in a bedside table lamp or your overhead light socket. Once you’ve fitted the bulb, everything else is controlled from the MagicLight WF which works on both Android and iOS devices. 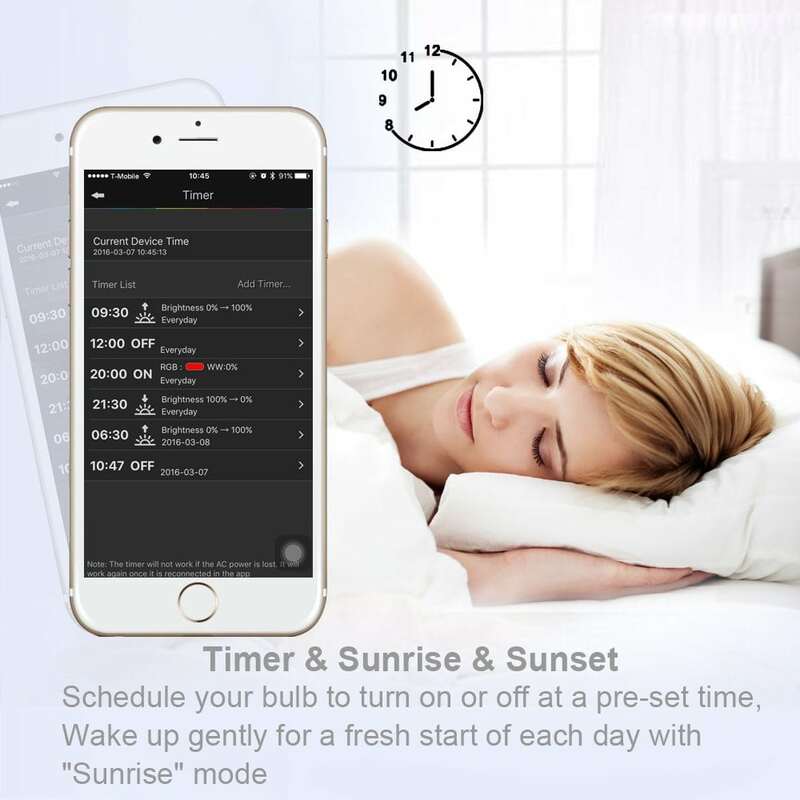 The advantage of having software control over your light source is that unlike standalone sunrise alarm clocks, the app gives you almost infinite control of how you set up your sunrise. In summary, the MagicLight Pro Smart LED Bulb gives you an almost infinite amount of control for a sunrise simulation as well as a host of other sophisticated ways to turn your domestic lighting into a truly smart home. 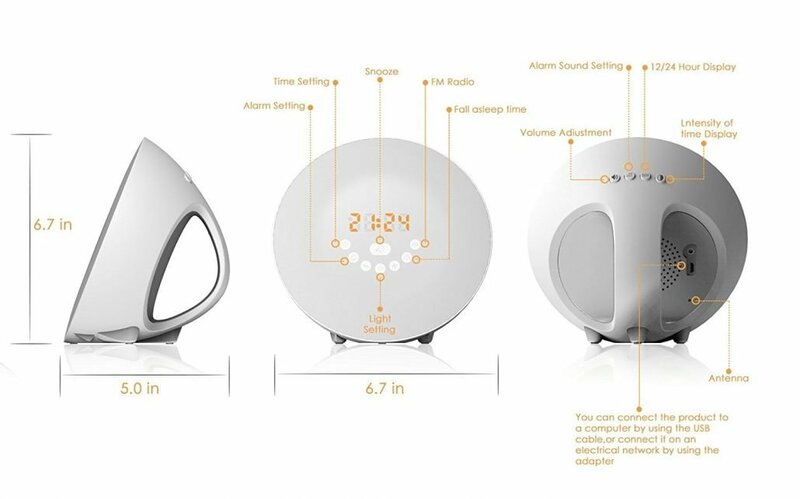 Sometimes described as the ‘Withings Aura Connected Alarm Clock’ the device is a smart, multi-function designed alarm system designed to improve your sleep experience with its range of sophisticated sound and light programs. Note: You can buy the Withings Aura as a standalone device, or purchase it with the optional under-mattress sleep sensor. This turns your Aura into a sophisticated in-bed sleep tracker which integrates with the Withings Health cloud platform. If you want to know more about the sleep tracking features, please see our full, detailed Withings Aura review here. The Withings Aura is a striking design, bearing a passing resemblance to a ship’s funnel. The bottom section house the speaker grill and clock, whilst the top conical section is a cleverly designed multi-coloured LED lighting system. There are no visible buttons, the whole unit hides a series of touch sensitive controls for various functions including turning the unit on and off, volume controls, and activating and adjusting the various light programs. Before you use the Withings Aura you need to first set the unit up by pairing it with your Wifi connection. You then need to download the Withings Healthmate app to your Apple or Android phone where you can setup the device with your various preferences. Once you’ve completed the setup, most of the functions can be accessed from the unit’s touch sensitive controls, so you don’t have to rely on the app for daily use. The Aura features a range of sophisticated light and sound programs which include several sunrise and sunset simulation modes. You can set individual sunrise alarms to wake you with a gradual multi-colored dawn simulation effect. The Aura can also provide the same effect in reverse and function as a sunset simulator to help lull you to sleep. As well as the light show, the Aura packs a lot of punch in terms of sound and music. There are several options for audio. You can wake up to a range of gentle nature sounds, or if you prefer you can use one of the specially commissioned music tracks which cleverly change in pace and tempo as the sunrise alarm nears your wake up time. If that’s not enough for you, the Withings Aura is also unique in that you can connect to Spotify Premium to wake up to over 20,000 internet radio stations or any Spotify playlist of your choice. All in all, the Withings Aura is an extremely sophisticated, but easy to use alarm system with a sophisticated sunrise simulator and an unprecendented range of options for music and sound. 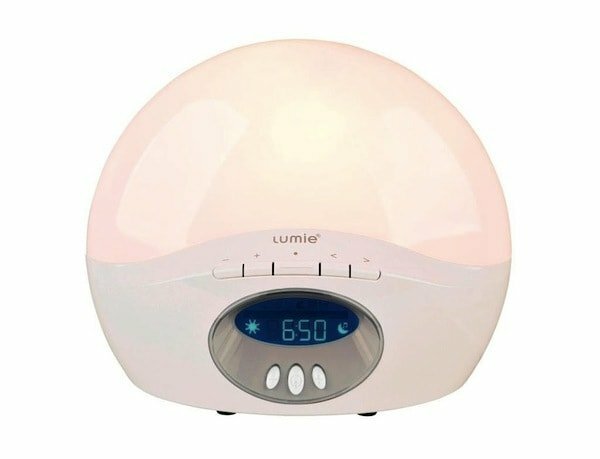 Lumie know a thing or two about sunrise alarms. They invented the world’s first wake-up light over 20 years ago and have been researching and designing light therapy products for seasonal affective disorder (SAD) and other medical conditions since the 1990’s. The Bodyclock Active 250 is a mid-range offering from Lumie, and as well as being a fully featured dawn simulator, it offers a range of sound options too. Instead of LED lights, theActive 250 Wake-Up Light uses a 42W energy saving halogen bulb. This is the equivalent of a standard 60W domestic light bulb and is rated to last around 2000 hours. Luckily bulbs are cheap to replace as they’re widely used in normal lighting fixtures. Because Lumie has worked with specialist medical teams for decades the Active 250 is a certified medical product and conforms to the Medical Devices Directive EC93/42. It features an attractive semi-circular design with 3 buttons on the front to control all functions including setting the time. The duration of the sunrise simulation can be set at either 15, 20, 30, 45, 60 or 90 minutes. The sunrise light shifts through a pleasing range of colors, starting with warm red, through to amber, yellow and white at your designated wake-up time. The light is fully dimmable and you can also use it as a reading light at night. The Lumie Active 250 can also be used in reverse as a night-time sunset simulator, with the light gradually fading to black as you fall to sleep. The LCD clock display is also dimmable or if you wish you can turn it off completely. In the sound department, you can choose to wake up with either the built-in FM radio with digital tuning or a choice of 6 nature sounds including crashing waves and dawn chorus. A great additional feature is that the Bodyclock Active 250 also comes with a built in white noise generator that you can use to fall asleep with to mask unwanted sounds that are keeping you awake. Overall, the Lumie Active 250 is a solid choice for a wake-up light from a company with decades of experience and research in building quality sunrise alarms and light therapy devices. The Nature Bright Sun Bliss is a small, portable super-bright light-therapy device with a sunrise timer. Nature Bright has helping people with its range of light therapy products since 2001. The SunBliss Portable Light Therapy 2 in 1, is as the name suggests, a small, powerful light therapy lamp that also doubles up as a sunrise wake-up alarm. 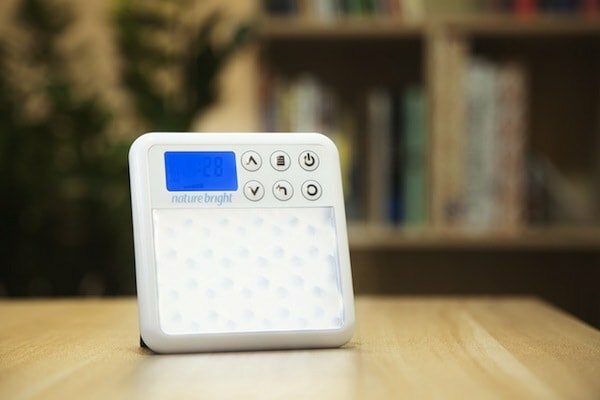 Being a light therapy device, the Nature Bright SunBliss is rated at an impressive 10,000 lux, which the recommended brightness level for condition such as seasonal affective disorder (SAD). Although extremely bright the unit features a special LED diffusion system to protect your eyes. It’s extremely compact and lightweight, so you can easily pop it in your bag should you wish to benefit from light therapy at work, at college or if you are travelling. Bear in mind though that the Nature Bright Sun Bliss cannot be powered from batteries, so you will need to find a mains socket to plug it in. In sunrise mode, you can place the device on your bedside table and set your preferred wake-up time. Then, 30 minutes before that time the Sun Bliss will gradually increase in brightness until it reaches its full 10,000 lux at your designated alarm time. You can also set an audible alarm tone to go off at the same time, if the bright lights are enough to rouse you. Wake up lights come in many different shapes and sizes, but the principle is the same. You set your wake up time before you go to bed. Then, a set number of minutes before your alarm goes off, the light gradually increases until it reaches maximum brightness at your desired wakeup time. Many sunrise alarm clocks can also play a choice of sounds to accompany your wake-up light. However, because the light has helped ease you out of deep sleep, you can opt for a gentler sound track to wake you up, rather than an ear-splitting alarm tone that would normally wake the dead. The problem of using a traditional alarm clock and being startled out of your sleep by a loud noise is that it can result in a feeling of grogginess which can make you feel grumpy, tired, and can last for hours, or sometime even the whole day. This phenomenon is known as sleep inertia and it happens because you’re woken when you’re in the deep, or slow wave phase of your sleep cycle and is what you experiencing when you say you ‘got out of the wrong side of the bed’ in the morning. A sunrise alarm clock allows you to wake up each morning in a more natural and gradual way, helping your body clock to naturally shift from deep sleep into light sleep, then into wakefulness. This more natural way of waking can help to prevent the negative effects of sudden awakening, which can ruin your morning, and even your day. Scientists first studied the effects of artificial dawn simulators in the 1970s and have found them to be effective at controlling the circadian rhythms of animals, even at a relatively low brightness. Light is effective as a wake-up mechanism because even though you’re asleep, light enters through the eyelids, triggering the release of cortisol, and kick-starting the body’s wake-up cycle. By the time the wakeup light has reached full brightness, the sleeper generally wakes up on their own, without the need for a blaring alarm tone or hitting the snooze button multiple times. As well as helping to prevent sleep inertia, wake up lights have many other benefits for your sleep and general well-being. Fortunately if neither a traditional alarm clock, or a smart alarm isn’t working for you, there’s another option. Instead of waking up to sound, you can wake up to light. Our bodies have evolved over millions of years to wake up with the rising sun. Our eyes contain special photo-receptors that use the signal of early morning light to prepare the right cocktail of hormones such as cortisol, to ready us for the day ahead. With a gradual sunset effect, your brain can respond to the light, and ensure you’re best prepared for wakefulness. When a loud alarm startles you awake from deep sleep, you may think you’re fully alert, but your brain is still playing catch-up. The foggy feeling of sleep inertia slows you down, and makes it harder to get out of bed. With a sunset alarm clock, the wakeup process is gradual and gives your body and brain an opportunity to prepare for the transition from sleep to wakefulness. Seasonal affective disorder (SAD) is a clinical condition where lack of daylight can cause depression and many other mood disorders. But the ‘winter blues’ is a general feeling we all have. When it’s pitch black outside in the morning, it’s much harder to get out bed. It’s well known that exposure to different levels of light can have an effect on our psychological well-being. Light therapy is a treatment that uses a very bright (usually at least 10,000 Lux) lamp to treat winter depression (aka SAD). However, studies have shown that dawn simulation devices, using much lower brightnesses are also effective in treating winter depression. – cortisol : cortisol also performs many other vital functions including reducing inflammation, regulating blood pressure, and also controlling our sleep/wake cycle. Exposure to simulated daylight in the morning can help boost cortisol in the morning ensuring better overall hormone balance. – melatonin : this hormone helps to ready the body in preparation for a good night’s sleep. Some people use melatonin supplements but studies have shown that early morning light exposure can help to influence the onset of melatonin at night by shifting the body clock. Probably the most important factor to consider in a wake up light is the maximum brightness of the light source. You can think of the brightness of the light as being similar to the volume of an alarm tone. The brighter the light source, the more effective it will be in rousing you from slumber. Just as standard light bulbs vary in brightness, so do the light sources in sunrise alarm clocks. Whereas domestic light bulbs are usually measured in terms of power ( Watts or ‘W’), sunrise alarms are measured in terms of light intensity using a unit called ‘lux’. However, lux needs to take into account the distance to the light source, and manufacturers don’t always quote the full specifications, so take note when you’re looking around. Most sunrise alarms fall into the range between 100-300 lux, however, light therapy lamps, often used to treat seasonal affective disorder (SAD) aka the ‘winter blues’ can go all the way up to 10,000 lux. Generally speaking, you should go for as bright a light as you can afford. Another important factor is the color of the light source in your sunrise alarm. The more basic models feature only one color, usually a yellow/white light, similar to the glow of a standard light bulb. Higher end models feature multi-colored light spectrums which mimic the natural effect of the sunrise in more detail, subtly morphing from red, to amber yellow and white as you approach your wake up time. Lighting technology has moved on considerably in the last decade or two. Most of the modern sunrise alarms now consist of low-energy LED’s. The benefit of using LEDs is that they don’t generate much heat and can come in multiple colors. The downside is that LED lights are generally not replacement, although they do tend to last for a long time. The company that invented the dawn simulator, Lumie, however, still uses replaceable halogen bulbs for many of its wake-up lights. Some people prefer the quality of halogen over LED light, so this may be an important decision making factor in your purchase. Again this is a very important consideration. Most people like to combine their sunrise alarm with a traditional audible alarm. Fortunately, most wake-up lights also have some form of alarm tone, although there are a lot of options. Whilst the most basic dawn simulators feature only a basic beeping alarm, more sophisticated devices may sport an FM radio to play your favorite station, nature sounds, or even integrate with Spotify to choose from a library of millions of songs to choose to wake up to. If you want to control the length of your ‘sunrise’ you will need to pick a device that gives you adjustable timing control. Whilst some wake up lights have a fixed (usually 30 minutes) amount of time before they reach maximum brightness, other devices let you control the amount of time, from 15 minutes up to an hour. This is very much a personal preference, so make sure you choose correctly. Many wake-up lights also double up as ‘sunset’ simulators. This allows you to have a fading sunset effect at night to help you wind down. Instead of gradually increasing in brightness, from warm colors through to bright white light, a sunset effect starts off in the yellow spectrum and gradually dims to complete darkness, and depending on which model you choose, it can also change to warmer red spectrum light as it’s fading out. Sunset effects are useful for people who have trouble falling asleep, and would prefer to ease more gradually into darkness, rather than merely switching off the light and lying awake in bed. Light therapy is a recognised treatment for a range of conditions including seasonal affective disorder (SAD), mood and sleep disorders, skin complaints and eye conditions. Many people use SAD lamps during the winter months to compensate for the lack of natural daylight and they tend to have light intensities measured in thousands of lux rather than hundreds. A lot of light therapy lamps now double up as a wake-up light, so if you’re looking for the ultimate in the brightness stakes, look for a sunrise alarm clock with light therapy features. Waking up to light is great way to boost your energy in the morning and align your body clock. 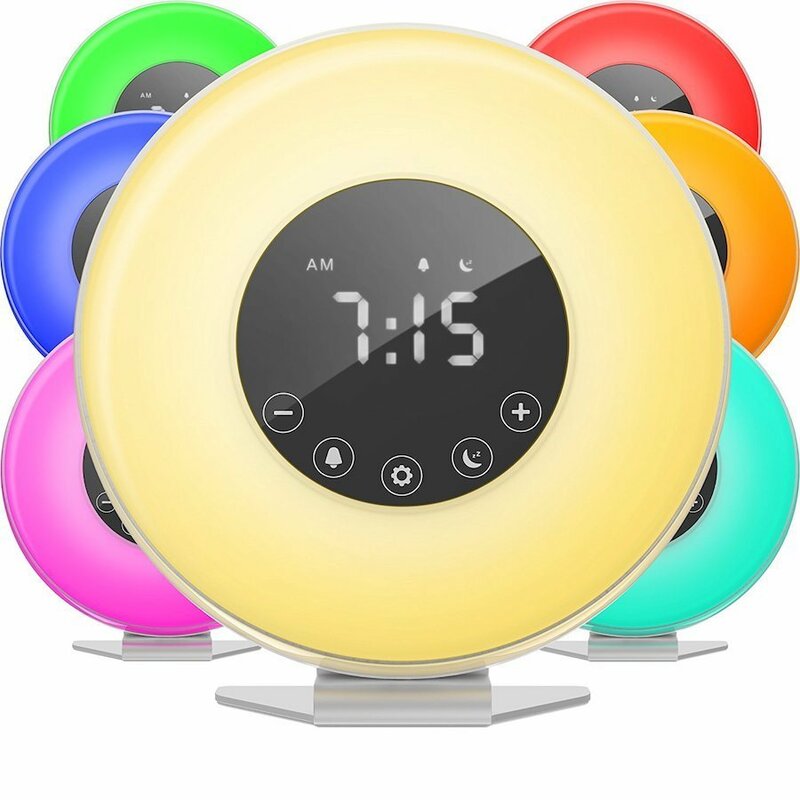 As you can see there are many different options for sunrise alarm clocks – standalone devices, smart light bulbs, light therapy lamps – but they can all achieve the same end goal, to gradually bathe you in gentle light and avoid startling you out of sleep.